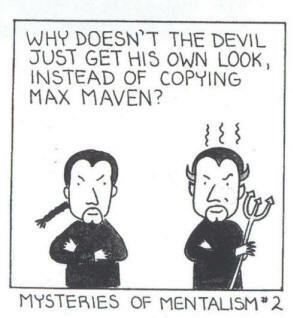 This devilish fellow is Max Maven! Max is world famous for his many terrific television appearances, his prolific writings, his superb knowledge of the history of magic and mentalism, his wicked humor, and his generosity. Not to mention doing the all-black mentalist look better than anybody! I first met Max at a Houdini auction in L.A. He was eating mints and sitting halfway on my chair and making pithy comments about everyone in front of us. He was so much fun and so funny! Neither one of us bought a Houdini, but we still had a great time. Little did I know one day I would make him tuna salad sandwiches for lunch! Here's a cartoon I did about Max. I hope he likes it!